New version 2.10 of Most Popular Solitaire is now available for both Windows and Mac. Most Popular Solitaire is a collection of 30 of the most popular solitaire games. This update includes bug fixes and Windows 8 compatibility. This is a free update for all registered users - just download the trial version and use your registration code to make it the full version (it will find your code automatically if you have the full version installed already). The update of Most Popular Solitaire for Mac OS X includes bug fixes, Mountain Lion compatibility and support for Apple's new Gatekeeper security feature. The trial version can be downloaded from http://www.moposol.com/download.html . This is a free update for all registered users of Most Popular Solitaire - to update your full version, just run the game,go to the Internet menu, and select "Download Latest Version". Most Popular Solitaire is US$16.95. You can order online from http://www.moposol.com/orderonline.html . New version 4.10 of FreeCell Plus is now available for both Windows and Mac. FreeCell Plus is a collection of 8 FreeCell type games, including FreeCell, Sea Towers, and Penguin. The update of FreeCell Plus for Mac OS X includes bug fixes, Mountain Lion compatibility and support for Apple's new Gatekeeper security feature. The trial version can be downloaded from http://www.goodsol.com/freeplus/download.html . This is a free update for all registered users of FreeCell Plus - to update your full version, just run the game, go to the Internet menu, and select "Download Latest Version". FreeCell Plus is US$9.95. You can order online from http://www.goodsol.com/freeplus/orderonline.html . 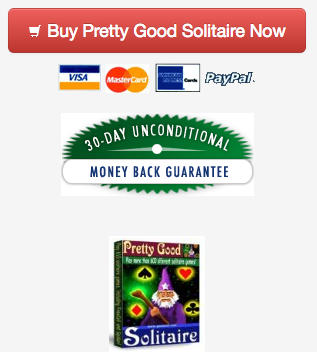 Pretty Good Solitaire's facebook page is at http://www.facebook.com/goodsol . Like us! 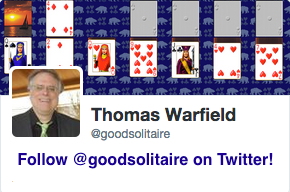 Be among the first to +1 Pretty Good Solitaire! Also, don't forget our blog at http://www.asharewarelife.com and our discussion forum at http://www.goodsol.net/forum . If you ever wonder whether a particular game number can be solved, go to the forum and post about it, someone there can probably solve it or determine that it cannot be solved. This game is at Barney's Spider.